A dozen ministers and leaders of the ruling Congress and Janata Dal-Secular (JD-S) coalition government on Monday jointly launched their campaign for the five by-elections in Karnataka on November 3. 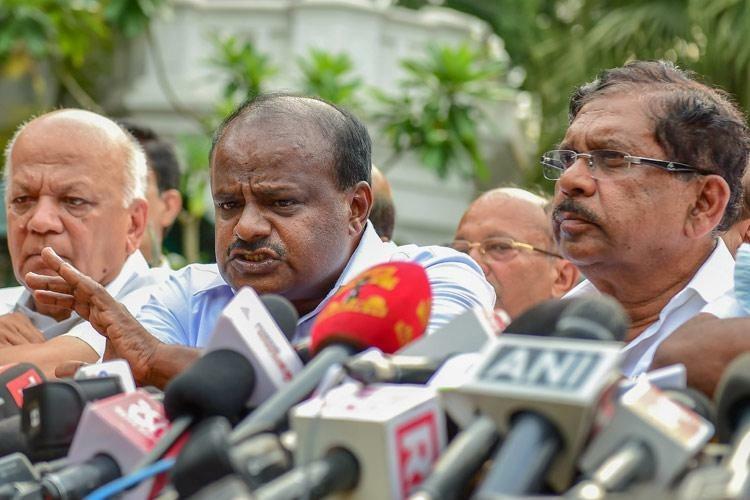 With Dussehra holidays ending on Sunday, senior leaders and ministers of the both the parties have fanned out in the three Lok Sabha and two assembly segments to campaign for the joint candidates, a Congress official told IANS in Bengaluru. The three parliamentary seats are Ballari (reserved), Mandya and Shimoga while the two Assembly seats are Jamkhandi in Bagalkote district and Ramanagara near Bengaluru. Former Congress Chief Minister and party leader in the Assembly Siddaramaiah addressed public meetings and participated in rallies in Ballari for its candidate V.S. Ugrappa, a senior legislator in the legislative council. In Jamkhandi, Deputy Chief Minister G. Paramehswara campaigned for Congress candidate Anand Siddu, son of Siddu Nyamagouda, whose death in a road accident on May 28 necessitated the by-election. “We are confident of winning in all the five seats as our alliance partners have fielded joint candidates to prevent division of secular votes and defeat the BJP at any cost,” said a Congress leader. In the Shimoga contest, the party’s state unit president Dinesh Gundu Rao and Revenue Minister R.V. Deshpande participated in the campaign for JD-S contestant Madhu Bangarappa. “We have joined hands to keep communal forces out; both at the Centre and state levels. We will be successful,” asserted Parameshwara. In Mandya and Ramanagara, where JD-S candidates are in the fray, district leaders and cadres campaigned and held roadside meetings and went on door-to-door canvassing. L.R. Shivarama Gowda is the JD-S contestant in Mandya. In Ramanagara, JD-S contestant Anitha, wife of Chief Minister H.D. Kumaraswamy, will campaign from Tuesday. For the BJP, party’s state unit president B.S. Yeddyurappa, K.S. Eshwarappa, C.T. Ravi and Shobha Karandlaje campaigned in Shimoga where the former’s son B.Y. Raghavendra is contesting. BJP’s legislator B. Sriramulu campaigned for his sister and party’s contestant B. Shanta in Ballari (Scheduled Tribe). BJP’s candidates are Siddaramaiah from Mandya, Srikant Kulkarni from Jamkhandi and L. Chandrashekar from Ramanagara. Besides candidates of the three main parties, about 30 independents are in the fray in all the five seats. Vote count will be held on November 6.